One of my favorite films this year, “H.” is simultaneously a fascinating inspection of adult relationships, and also a mesmerizing sci-fi mystery. “H.” is Helen, a 60-something woman married to Roy, a kind, caring retiree. They love and care for each other, but there’s also a sad, undefinable absence in their life together. “H.” is also a younger woman named Helen, a successful, pregnant artist in a vibrant yet uncertain relationship with her creative partner, Alex. Both Helens live in Troy. (Troy, New York.) The elder Helen of Troy fills the emptiness inside her by caring for a “Reborn,” an extremely lifelike baby doll. She bathes it, burps it and sets her alarm for 5 a.m. in order to wake up and bottle feed it. The younger Helen also has an emptiness inside her, and tragically, child issues of a far more troubling kind. Meanwhile, a giant Greek head of solid stone (the mythological Helen?) magically floats down the Hudson River to be taken into Troy. “H.,” it seems, may also stand for “horse”… an ominous Trojan Horse. In literature, there are contradictory versions of Helen’s mythology. So too in this film. Alternating back and forth between their two Helens, writers/directors Rania Attieh and Daniel Garcia tell their tale in four chapters plus a coda. Each Helen suffers a horrible loss and descends into madness. And while the two never meet, their lives do have points of intersection. Slow, but very beautiful, “H.” enchants. There’s an inexplicable explosion in the sky. Objects occasionally fall upward. People turn toward walls and stand motionless for long periods of time. And then they disappear entirely. Is it God? Nature? An alien invasion? That none of this is fully explained somehow makes perfect sense. Why do people fall out of love? Or wander off in search of something else even when love is present? 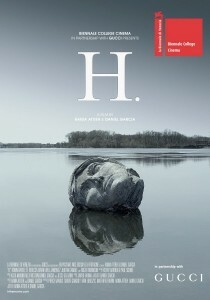 “H.” screened on Sun., Nov. 15, as part of the 2015 Ithaca International Fantastic Film Festival. For festival information, go to ithacafilmfestival.com.